All of our tyres are sold "as is". ALL TYRES ARE PRESSURE TESTED AND THERE IS NO PUNCTURE REPAIR. IF YOU CANNOT FIND THE TYRE SIZE YOU REQUIRE. // YOU SAVE AT LEAST £190 // WE GUARANTEE YOUR TYRE IS: * Pressure Tested to 40lbsi * Quality Inspected by Experienced Technicians * VOSA-Approved Tread Tested * Washed using specialist, non-corrosive products // SPECIAL FEATURES * Auto Express: "Consistent performance in all areas, best in wet and dry braking." * "Outstanding grip and stability during cornering". ZR19 (100Y) XL. 6.0 MM TREAD. Tread depth - Outer edge. Tread depth - Inside edge. Tread depth - Middle. Cash - Collect in person from our - Depot, but be sure to call us before hand to arrange. Any Puncture Repair. Credit or Debit Card - Call us. This tyre still has a. minimum of 5.6MM! tread remaining. In fact, due to there uniquely designed tread pattern, they are FANTASTIC and super responsive in wet weather conditions also! Tread depth - Outer edge. Tread depth - Inside edge. Tread depth - Middle. This tyre has a minimum of 4.6mm of thread remaining, a new tyre has 8mm. Cash - Collect in person from our - Depot, but be sure to call us before hand to arrange. QUALITY TYRES X4. YOU ARE BUYING 4 TYRES. SIZE 255 40 R19. TREAD 6 MM. NOTE: Due to the lighting and positioning of the pictures taken of this tyre, we understand it may be difficult to make out the tread depth of the tyres. Full fitting of tyres. TREAD DEPTH : 7mm . TYRE WIDTH : 235. Part worn tyres are graded based on the tread depth with Grade A at 5mm and Grade B at 4mm-5mm. It is in the nature of part worn tyres to have puncture repairs, tiny cuts or nicks to the side wall protectors however this will be clearly noted on any adverts. AB13, AB14, AB15, AB23, AB30, AB31, AB32, AB33, AB34, AB35, AB36, AB37, AB38, AB39, AB41, AB42, AB43, AB44, AB45, AB51, AB52, AB53, AB54, AB55, AB56 TR21, TR22, TR23, TR24, TR25, FK19, FK20, FK21, G63, G83, G84, HS1, HS2, HS3, HS4, HS5, HS6, HS7, HS8, HS9, IV1-28, IV30-32, IV36, IV40-49, IV51-56, IV63, KA27, KA28 KW1, KW2, KW3, KW5, KW6, KW7, KW8, KW9, KW10, KW11, KW12, KW13, KW14, KW15, KW16, KW17, PA20-38, PA41-49, PA60-78, PH3-11, PH15-26, PH30-44, PH49-50, ZE1, ZE2, ZE3. ZR19 (100Y) XL. NEW TYRES HAVE BETWEEN 7 -. 8 MM TREAD. If you are outside mainland. ZR19 (100Y) XL A0. NEW TYRES HAVE BETWEEN 7 -. 8 MM TREAD. If you are outside mainland. NOTE: Due to the lighting and positioning of the pictures taken of this tyre, we understand it may be difficult to make out the tread depth of the tyres. Full fitting of tyres. TYRE WIDTH : 255. TYRE ASPECT RATIO : 40. If you are outside mainland. 6 MM TREAD WITH A PUNCTURE REPAIR TO BS REGS. ZR19 (100Y) XL A0. NEW TYRES HAVE BETWEEN 7 -. If you are outside mainland. All of our tyres are sold as they are. PART WORN TYRE. AO rated extra load. £17 for pair. Tread depth - Outer edge. Tread depth - Inside edge. Tread depth - Middle. This tyre has a minimum of 3.0mm of thread remaining, a new tyre has 8mm. Cash - Collect in person from our - Depot, but be sure to call us before hand to arrange. TYRE WIDTH : 255. TYRE ASPECT RATIO : 40. NOTE: Due to the lighting and positioning of the pictures taken of this tyre, we understand it may be difficult to make out the tread depth of the tyres. TREAD DEPTH : 6mm . This tyre still has a. 'AO' - AUDI ORIGINAL (BUT CAN BE FITTED ONTO ANY VEHICLE). minimum of 4.7MM! tread remaining. In fact, due to there uniquely designed tread pattern, they are FANTASTIC and super responsive in wet weather conditions also! TYRE WIDTH : 255. TYRE ASPECT RATIO : 40. NOTE: Due to the lighting and positioning of the pictures taken of this tyre, we understand it may be difficult to make out the tread depth of the tyres. TREAD DEPTH : 6-7mm. Tyre is stepping very slightly on the edge. 573 BB M R. minimum of 6.2 MM! of tread remaining. In fact, due to there uniquely designed tread pattern, they are FANTASTIC and super responsive in wet weather conditions also! R19 (100Y) XL. NEW TYRES HAVE BETWEEN 7 -. If you are outside mainland. TYRE WIDTH : 255. TYRE ASPECT RATIO : 40. NOTE: Due to the lighting and positioning of the pictures taken of this tyre, we understand it may be difficult to make out the tread depth of the tyres. TREAD DEPTH : 5mm . 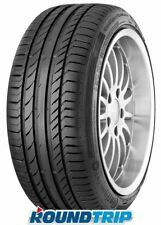 4 X 255/40 ZR19 CONTINENTAL SPORT CONTACT 2 TREAD 8mm "OLD STOCK"
All of our tyres are sold "as is". ALL TYRES ARE PRESSURE TESTED AND THERE IS NO PUNCTURE REPAIR. This is in fairly good condition, with at least 5mm of tread remaining. Tyre has a minimum of 5.5mm of tread. TYRES PRESSURE SERVICE KITS. TYRES MUST BE UNUSED & NOT FITTED. IV 1 to IV 28. AB 40 to AB 56. Giving you Precision,Endurance & Performance on your tyre wear?. ISLE OF MAN (IM) CHANNEL ISLANDS. PA 21 to PA 38. Designed for sports and high-performance vehicles. The super-sports tyre with superior handling for maximum fun. Outstanding grip and stability during cornering. It has been properly warehoused and was never mounted. Continental Conti Sport Contact 2 255/40 ZR19 100Y XL, FR, MO. 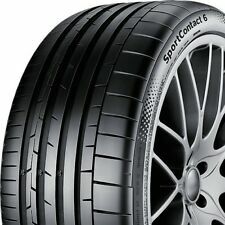 Continental Conti Sport Contact 5 SUV 255/40 R19 100W XL. TYRE SPEC Ending Soon. Part Worn Tyres Online! Our garage supplies and fits quality part worn tyres. We Believe That You Will Not Find Better Value. Pressure Safety Tested: Yes. Repairs: None. Condition: Good. Tread Depth - 4.5mm (New Tyre 8.0mm). TYRE STANDARDS. Excellent Condition / Tested on Rim / With No Punctures or Repairs. WE BELIEVE THAT YOU WILL NOT FIND BETTER VALUE FOR MONEY ONLINE! DARLASTON WS10 8LX, for just £10.00 which includes wheel balancing. 2x Continental Sport Contact 6 255/40 ZR19 100Y XL, FR.